Nearly five years into sales of its copy data virtualization, Actifio is finding customers are looking for a simpler way to manage data across its appliances. Today the vendor launched Actifio Global Manager (AGM) and a new Actifio Report Manager to give customers one HTML5 screen to manage their installed appliances. AGM lets customers set service level agreement-based management from one interface. Actifio previously had a report manager, but the new one is re-designed with a new engine to create, manage and view reports on application, protection and recovery job performance, and SLA compliance. 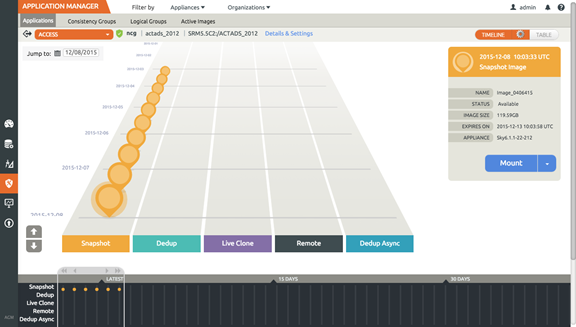 Until now, Actifio customers used a desktop user interface to manage one appliance at a time. Chandra Reddy, Actifio’s vice president of product marketing, said the average Actifio enterprise customer uses Actifio to protect 100 TB of data, and some protect petabytes. To protect 100 TB, an organization would need two appliances on site and two more at a remote site for DR. Those four appliances would be managed separately without AGM. Service providers might use 30 or more appliances, Reddy said. “Now a customer can go to a single dashboard and get an aggregated view,” he said. Customers can use AGM to migrate applications between Actifio appliances and to load balance applications across appliances. AGM also allows customers to manage processes such as snapshots, deduplication, live cloning and replication. AGM will require a separate license. For new customers, AGM is free for the first two Actifio appliances and existing customers will not be charged for their first 10 appliances.